I just finished reading 10 Tips to LinkedIn Status Updates by Andy Robinson. This is a fantastic list of things you can do to Add Value to your professional network, meanwhile increasing the number of visitors to your profile. If you’re using LinkedIn to build your Personal Brand, get noticed by employers and recruiters, or building your professional network, take note… these simple tips work. In fact, for the last 6 weeks, I’ve been running a LinkedIn social media marketing campaign, based solely on sharing relevant and excellent quality articles, similar to what Andy was mentioning. I have a large LinkedIn network (14,000+ 1st degree connections), so I wanted to see if I could “Activate” it through Updates on my personal profile, and in highly targeted LinkedIn Groups. Between Thanksgiving and New Years, I started getting more involved with sending updates through my LinkedIn Account. Then, with the first week of the new year in play, and thousands of people “restarting” their New Years resolutions and “job searches”, I committed to actively updating my LinkedIn profile. At first, I wasn’t doing it very often, only a couple times per week, but as I got into the rhythm, I was able to post more updates on a daily basis. In a few short weeks, from less than a couple hours of actual content curation and writing my own blog posts, I was able to increase the number of viewers to my LinkedIn Profile, by over 500%, in less than 6 weeks. 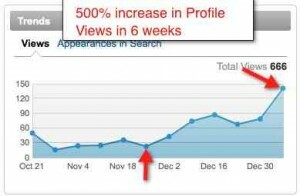 When I started, I was averaging about 4 views per day to my LinkedIn Profile. The first 4 weeks were pretty slow, as I wasn’t doing it consistently, and I wasn’t really putting much effort into an organized campaign. Additionally, it was between Thanksgiving and New Years, when pretty much nothing happens in the Job Search, Career, and Recruiting markets. Then, once I got a system in place that allowed me to update several times throughout the day, without continually interrupting my normal daily workflow, things started to change dramatically. On week 5, between Christmas and New Years, I started sending about 2 updates per day, on average. I would seek out timely, and quality job search articles, career advice blog posts, LinkedIn How-to advice, Youtube videos, recruiting and human resources news, and general business news. I also wrote two of my own blog posts, and posted them in multiple LinkedIn Groups, as well as posted links to the blog posts on my profile. On week 6, I increased the number of daily updates to 3-5 updates per day. The results show a 500% increase in Profile Views in just 6 weeks, most of which time was spent learning and testing, and not updating. My profile went from 4.25 avg views per day to about 22 views per day, and climbing. Updates certainly get you attention. 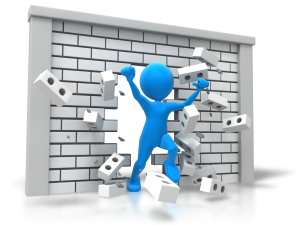 The question is do the updates have a direct impact on your brand and blog and social authority. I would say yes to each of these questions. LinkedIn is by far the biggest driver of traffic to the GO Jobs Career Blog, with 77% of traffic coming from LinkedIn. As my topics and articles were of a professional nature, this makes perfect sense. Facebook and Twitter are only marginal sources of traffic, yet I share the same links. Facebook and Twitter are also have different social cultures to them. At this time, I don’t want to blast all my ‚Äújob search‚Äù and ‚Äúrecruiting‚Äù topics to my friends a family who are connected to me on Facebook, so I didn’t share much of this content on Facebook. I am however starting a Jonathan Duarte facebook page, where I will add this content though. @Gojobs twitter account, with 250 followers. The GO Jobs Company Page, on LinkedIn, with a mere 17 followers. While this is just one, isolated, social marketing test, I know that I found a formula to grow an audience with a network of users who are taking action… the key ingredients in a successful social marketing plan. If this report was helpful to you, please use the buttons below to share it with your friends and fellow professionals, on LinkedIn, Facebook, Twitter and Google+. Comments are always welcome, too! I am receive 30 to 80 views per day and average about 250 appearances per day.